Back in the day, you had your “local”–the restaurant or bar right around the corner where you were a regular and everyone knew your name. The Daily Dish in Silver Spring is just such a place. Housed in the same space as the former Red Dog Cafe, the Daily Dish combines comfort food (think addictive mac & cheese, fresh home-made bread, wood-oven fired pizza) with a commitment to using local ingredients. Starters include baked local goat cheese with roasted tomato sauce and focaccia, homemade soups, and salads. 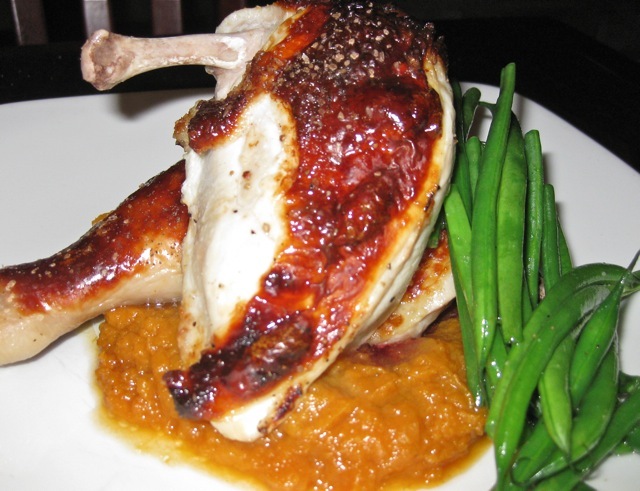 For dinner, you can tuck into a tender brined organic roast chicken served with green beans and mashed sweet potatoes or salmon made to order and served with creamy polenta and vegetables. Owners Polin and Jerry Hollinger bring many years of restaurant and catering experience to the venture and have tapped Chef Michael Chretien, formerly of Rock Creek Mazza restaurant, to head up the kitchen. The Daily Dish sources produce from local farmers and the Takoma Park Farmer’s Market, grains from the Silver Spring Co-Op, fair trade coffee from Silver Spring-based Clear Mountain Coffee, ice-cream from Moorenko’s, and sausages from Let’s Meat on the Avenue in Del Ray. They are also looking into getting meat and poultry from Polyface Farms. The wine list, carefully selected by Polin for both affordability and quality, includes three organic wines (Torrontes, Malbec, and Tempranillo) from the Santa Julia vineyard in Argentina as well as several offerings from Charlottesville’s Kluge Estate. On Sundays, don’t miss the “Make Your Own” Bloody Mary Bar, house-cured gravalax, or challah French toast. To kick the recession blues, try three-course $30 Thursdays or half-price wine Tuesdays. Who knows–with great food and deals like these, you, too, may become a regular. The Daily Dish is located at 8301 A Grubb Road, 301.588.6300, and is open seven days a week.